Come along as we set out on Lake Mälaren to feed Ospreys (and sometimes) White-tailed Eagles from a small boat. You will get good chances to take pictures of the birds as they descend to the surface to catch the fish we throw them. Sometimes ever so close, sometimes more distant. We start shortly after sunrise when the birds are active, the light is best and there are very few other boats out on the lake. Lake Mälaren with its archipelago hosts many pairs of breeding Ospreys. Between April and mid September they are present on the breeding grounds and busy catching fish to feed on. 6-8 birds regularly come close to the boat, eagerly accepting the meals we offer them. Several pairs of White-tailed Eagles also breed in the area and usually the same pair turn up to compete with the Ospreys. When the birds decide to grab a fish it all happens quite fast and you have to be ready with your camera. It's good to be very active as long as the birds are around. The more active you are observing and being ready with your camera, the better pictures you get. We always start to go through the equipment and share advice on settings and details. The optimal equipment for this is a medium sized lens between 300 mm and 500 mm, light enough to be hand held. A tripod is useless in the boat but a monopod could be of use if you have a bigger lens. It is however good to be prepared to move around a lot, so hand held is usually to prefer. On the way out we chum for Gulls who will be good targets to test your camera settings on as well as attracting the raptors. 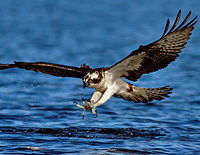 The Osprey is one of the most widespread birds of prey in the world. It inhabits all continents but the poles. 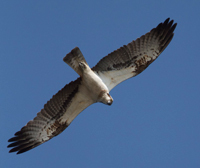 The Scandinavian Ospreys are migrating birds. They return from their African winter quarters in late March to early April. Soon they have established territories and start to fish in their home waters. The birds in this area have been fed by man during several years and the individuals know the routine. The offspring start learning to fly in early August. The male parents usually stay into September to feed them, while the females start their autumn migration. 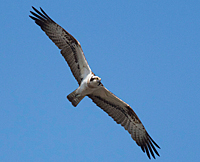 There are Ospreys in the area til mid-late September. Gulls and Terns often come by and among the more common species spring and summer can produce Black Terns, Little Gulls and sometimes Caspian Terns. Greater Black-backed Gull and Herring Gull, Mew Gull and Black-headed Gull are the more common species. Cormorants and Grey Herons breed in good numbers in the area. The season for Osprey is 1 May – 15 September. The Eagles keep coming throughout October and til the lake is ice covered in November – December. The dedicated photographer who really wants to get good shots of these impressive birds in action. Experienced guide with local knowledge of the birds and their habits. Lifejackets, hot drinks and snacks. warm clothes, camera, your own personal bottle of water, binoculars. A session starts at sunrise and last about 3 hours. 2.150 SEK/ person and session. We recommend long distance visitors to book 2 sessions to get the most of your visit.